In response to a growing trend in attacks that involve embedding malicious objects inside Office documents using the Object Packager control, Office is introducing a change to the default activation model for Packager objects in Office 365 applications. Prior to this update, executables or scripts (e.g. EXE, JS, VBS) embedded using the Object Packager control can activate when a user double clicks on the embedded object within the document. For objects considered high risk by Windows, users will see a security warning as shown below. If the user clicks “Open”, the object executes with the privileges of the signed in user. 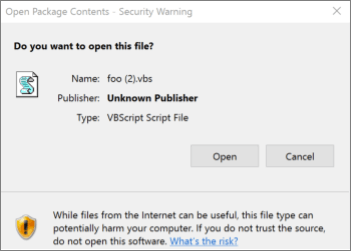 Attackers abuse this vector to social engineer users to activate malicious programs embedded inside Office documents by persuading them to click through this warning prompt. To protect users, Office 365 applications will, by default, block activation of objects considered high risk. The list of extensions blocked will be the same one used by Outlook to block attachments. The list of extensions can be found here: File extensions blocked in OLE package. If an embedded extension is not part of the list of extensions blocked by this mitigation, then the object is activated without any warnings from Office. Can I customize the extensions being blocked? Yes, Office provides two Group Policy options that allow an administrator to customize which extensions are blocked. You'll find each of them under Office/Security Settings/. This policy setting allows you to specify which file extensions Office won’t block when they are embedded as an OLE package in an Office file by using the Object Packager control. If you enable this policy setting, enter the file extensions to allow, separated by semicolons. Warning: Malicious scripts and executables can be embedded as an OLE package and can cause harm if clicked by the user. If extensions are added to this allow list, they lower the default security of the Office client by opening up attack surface that can be abused by an attacker. This policy setting allows you to specify additional file extensions that Office will block when they are embedded as an OLE package in an Office file by using the Object Packager control. If you enable this policy setting, enter the additional file extensions to block, separated by semicolons. Note: If you add a file extension under both “Allow file extensions for OLE embedding” and “Block file extensions for OLE embedding”, the extension will be blocked. Caution: Serious problems might occur if you modify the registry incorrectly by using Registry Editor or by using another method. These problems might require that you reinstall your operating system. Microsoft cannot guarantee that these problems can be solved. Modify the registry at your own risk. Exit any Office applications that you might have open. Start the Registry Editor by clicking Start (or pressing the Windows key on your keyboard) then typing Regedit and pressing enter. Have a question about Office that we didn't answer?